It’s a rare play that candidly states in its title what one can expect when they find their way inside it. 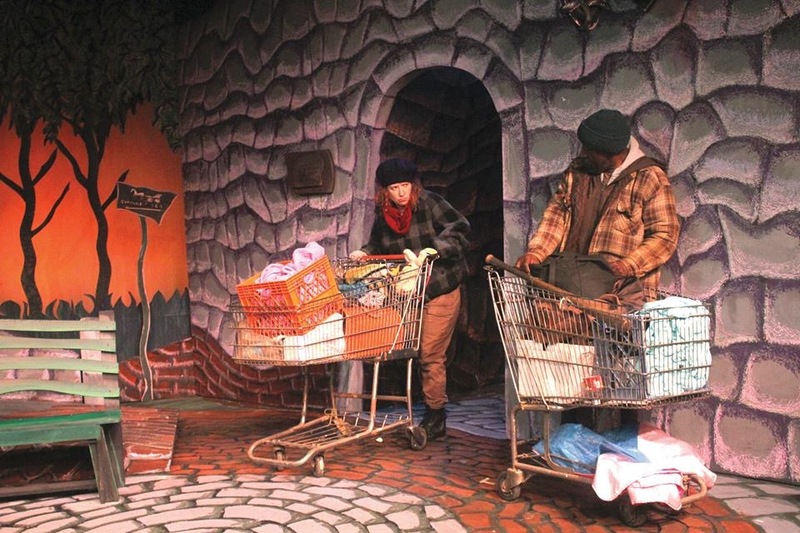 “Homeless and How We Got That Way”, the current presentation of the Detroit Repertory Theatre, is one of those plays. The story concerns Eloise and Sidney, and though they’re without a home in the sense of a structure with walls and windows and a roof over their heads, New York City’s Central Park serves as their ersatz home. It’s here where the two live, sleep, and engage in their favorite pastime, drinking. The grocery carts they push around contain all their “stuff”, what George Carlin, in one of his brilliant comedic monologues, called those personal possessions that we own. Sidney (Robert Vogue-Williams) is an African-American male, somewhere in his late 60’s. He’s quiet and reserved, and though he’ll respond when spoken to, he’s not much given to casual conversation. He used to be a neurosurgeon, but his hands shake too much now from the booze and he hasn’t touched a scalpel in 15 years. His wife is deceased and it’s been years since he’s had any contact with his adult children. This particular evening, which promises to be a joyous one because of the several bottles of purloined whiskey he has stashed with his stuff, he runs into another familiar Park traveler. Eloise (Leah Smith) is a white female some three decades younger than Sidney. She’s chatty and a bit brash as you might well expect from someone who claims to have written a book that was so good it was published by Scribner’s. She coaxes a swig out of Sidney’s bottle, then progresses to equal shares through sheer moxie. As the two proceed to make their way through the whiskey, they set up camp for the night. Over the course of the next two hours, we get to know a lot about these two unfortunate souls. Their often-times spirited conversations reveal them to be sensitive and harmless people to whom life has given, through no fault of their own, the short end of the stick. The “How I Got That Way” part of the title unfolds in bits and pieces. Eloise has memories of a demon that comes to visit her during the night and Sidney tells of a failed surgery that in retrospect he should not have performed. 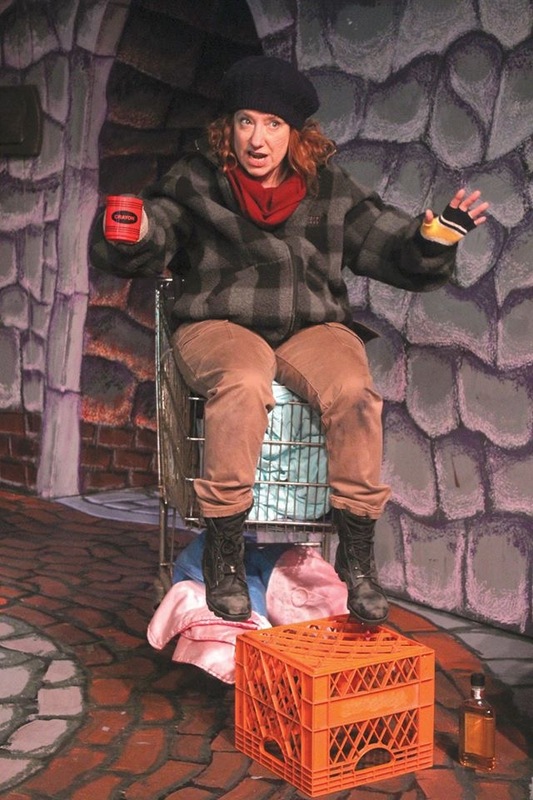 You might expect “Homeless” to be a somber play about two totally misdirected people wallowing in despair. In fact, playwright Dan McCormick instills in his characters a great deal of humor and humanity. The Detroit Rep’s production, as visually stimulating as it is thought provoking, provides a great evening’s entertainment. The nicely cast counterpoints of Smith and Vogue-Williams work well together as two people different in so many ways yet sharing a similar existence. Director Lynch Travis provides movement to a play that could easily bog down in wearisome dialogue. On another day, with another ‘couple’, Harry Wetzel’s Central Park set might have been peaceful and bucolic. But Eloise and Sidney are two persons who have been rubbed raw by their past and by their alcohol consumption. The DT’s and their resulting memory loss have turned this Central Park into a threatening place. The stoney alcove and the path’s pavers appear bloated and ominous. The light fixtures bend as if seen through an alcoholic haze and even the slats of the park benches seem to wave and dip. Costumes for the production are by Sandra Landfair, lighting design is by Thomas Schraeder, and sound by Burr Huntington. “Homeless and How We Got That Way” runs through June 26th. Tickets are available for purchase with MasterCard or Visa by calling 313.868.1347. Besides single seat tickets, Detroit Repertory Theatre has several subscription packages that can be purchased at any time and are good for a year from date of purchase. Visit their site at www.DetroitRepTheatre.com for more information or email them at DetRepTh@aol.com. The Detroit Rep Theatre is located at 13103 Woodrow Wilson in Detroit.